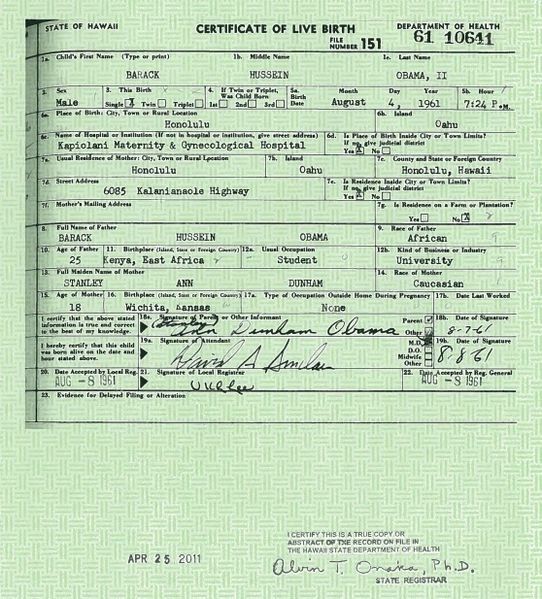 As one of the first acts of his reelection campaign, President Obama recently released his long form birth certificate. The controversy had followed Obama for at least three years and had continued in spite of the fact that he had released a copy of his short form birth certificate during the 2008 campaign. As discussed in an Examiner article from December 2009, Hawaiian government officials vouched for the authenticity of the first birth certificate released and it was sufficient to get an Illinois driver’s license, marriage certificate, to register as an attorney, and to serve as an Illinois legislator and US Senator. A Kenyan birth certificate that surfaced in 2009 was revealed to be a fraud. A conversation in which Obama’s Kenyan grandmother reportedly claimed to be present at his birth in Kenya was revealed to be taken wildly out of context. The birth announcements from Honolulu newspapers for baby Barack have long been available online. So why did Obama finally decide to release the long-awaited full birth certificate? There are likely two answers. First is the success of potential presidential candidate Donald Trump. Trump, who recently polled virtually even with Obama and tied with Huckabee as a Republican frontrunner, has attempted to make Obama’s birth certificate a mainstream issue. By releasing the birth certificate, Obama may be trying to discredit Trump as a potential opponent. Second, and more likely, Obama is probably responding to the “birther” bills proposed by several states. The bills, which would require that presidential candidates prove their citizenship before they could be added to ballot, have been proposed in several states. Arizona Governor Jan Brewer vetoed one such bill after it passed the legislature. Governor Bobby Jindal supports a proposed bill in Louisiana. A similar bill has been considered in Montana. Here in Georgia, a similar bill was proposed but did not pass before the legislative session ended for the year. Obama lost all four of these states in 2008, but might have a chance to win some of them in 2012. In Arizona, John McCain was running in 2008 and had the home-state advantage. McCain’s nine point margin of victory could be closer with a different Republican candidate in 2012, putting Arizona’s ten electoral votes in play. In Georgia, the margin was even closer. McCain won Georgia in 2008 by only five points. If 2012 shapes up to be a close race, Georgia’s fifteen electoral votes would be a valuable prize. 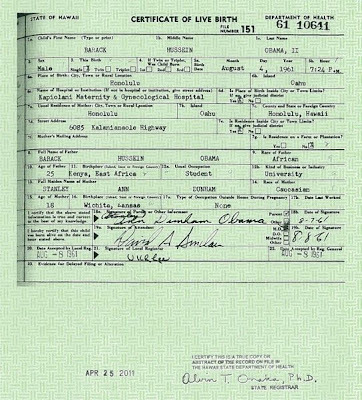 If either state passed a birther law before the 2012 election, Obama would not be on the ballot unless he submitted the birth certificate and would forfeit those electoral votes. Passage of the law in a few states might also encourage states with more electoral votes, like Texas or California, to pass a similar law. By releasing the birth certificate now, Obama eliminates the threat of the birther laws. An additional reason may be that Obama’s decision trumped the upcoming release of a new book about the birth certificate. “Where’s the birth certificate? The case that Barack Obama is not eligible to be president” by Jerome Corsi is scheduled for release on May 17. Corsi is also the author of “The Obama Nation,” another book critical of Obama, and coauthored “Unfit for Command,” a book widely credited with helping to sink John Kerry’s campaign in 2004. Beating Corsi to the punch might well have been an added incentive for Obama. Until now it was to Obama’s advantage to keep the birther controversy going. It provided an issue with which he could ridicule Republicans and conservatives and paint them as extremists. At the same time, while the country was focused on the birther issue, it was not looking at the economy, the deficit, or the wars in Libya and Afghanistan, issues where Obama is far more vulnerable. It remains an open question whether the new release of the birth certificate will satisfy die-hard birthers. There is already speculation that the birth certificate is a forgery. It is common knowledge that the CIA and other intelligence agencies have sophisticated forgery operations to create false papers for intelligence agents. Of course, the forgery theory discounts all the other evidence that Obama is a native born American citizen. If conservatives continue to push the birther theory in the wake of the new birth certificate, it will make them look even more extreme and out of the mainstream. They will provide an easy target for the media and late-night comedians. On the other hand, if conservatives take this opportunity to focus on the president’s record then Obama will be the one who seems out of the mainstream. For his part, Donald Trump seems satisfied with the birth certificate and is now pressing Obama to release his college records. Obama has never released his transcripts or writings from Occidental College, Columbia University, or Harvard. Although Obama campaigned on transparency in government, secrecy has been the order of the day in his administration. The health care reform law was conceived behind closed doors and a promise to post bills online for five days before signing them was one of the first broken promises of the new president. Even when the president recently received an award for promoting government transparency, he excluded the media and received the award in private.